I was six years old when I first learned of astrological signs. I came across the horoscope section of the New York Daily News and the words, “If you are a Virgo, you are a perfectionist,” seemed to have leapt off the page. The message rang loud and clear, and wreaked of truth. Even as a child, I spewed of perfectionism. At the time my intent, as well as my parents’ expectations were to consistently receive a score of 100% on every exam, regardless of the subject. When I couldn’t uphold this unrealistic promise and arrive home with a score of 96% or 98% I’d hear, “What happened to the other two or four points?” Laughter amongst my parents would quickly ensue, as if this were all some cruel joke that I was too young to understand. In retrospect I wasn’t hurt by the awkward experience, but became highly motivated to be the best student I could possibly be; at least in my parents’ eyes. I continued acting upon this mindset through the rest of my academic years, then into the workplace and eventually into my yoga practice. Not until I looked beyond the expectations of the mind did I see the reality of my perfectionist ways. The fact is, ego exists in many areas of life, and longs for perfection to gain superiority to others. The innate need to control everything. With control, no one else can be responsible for things going wrong. Only one person can achieve, or fail in the process, which gives the illusion of safety. Closing off the mind to new ideas. Marianne Williamson wrote, “Our deepest fear is not that we are inadequate. Our deepest fear is that we are powerful beyond measure.” Ideas that are formed to bring joy to oneself as well as others should never be kept hidden. The lack of perfection is by design. None of us would attain the wisdom from life experiences if there were no trials to master. Just because one’s perception of others’ lives might seem perfect, there is always someone who is looking at life from an imperfect perspective. Perfection stems from an egotistical mind. Ego is not responsible for all that happens, and it is not the enemy. However, when ego controls the mind, it gathers memories from the so-called “failures” of the past and drums up illusions that no longer exist, or never existed at all. Being in total presence does not mean being perfect. No life can be lived by another, and those who are mindful are able to stay within the boundaries of the life they own. They accept the circumstances completely as they are, without judgment. As soon as one becomes engulfed in the desire for perfection the joy of those experiences are taken from the here and now. Perfection is an illusion. Accept that some things will get done, and some just won’t. Instead of saying, “I have failed,” one can say, “I have discovered a way that can cause failure.” Failure is part of life. Once you release the fear of failing there will naturally emerge the truth of your Being. Imperfection is a beautiful and integral part of our society. Be lighthearted enough to laugh at life’s hiccups. It sets us apart while reminding us that we are all ONE. Life is imperfect. Happily embrace it in all its messiness. It’s your turn. 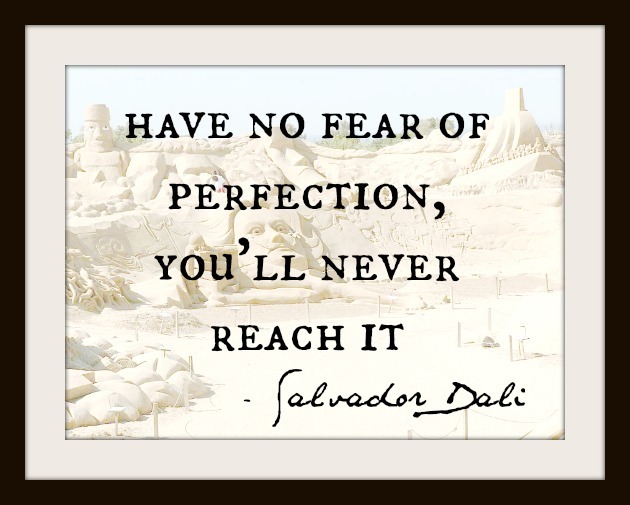 How have you handled perfectionism? Has it helped you or hurt you at home and/or the workplace? I’d love if you shared your comments below. Hi Michelle, I am stopping by to let you know that I featured your blog on my Shout Out Saturday blog of May.